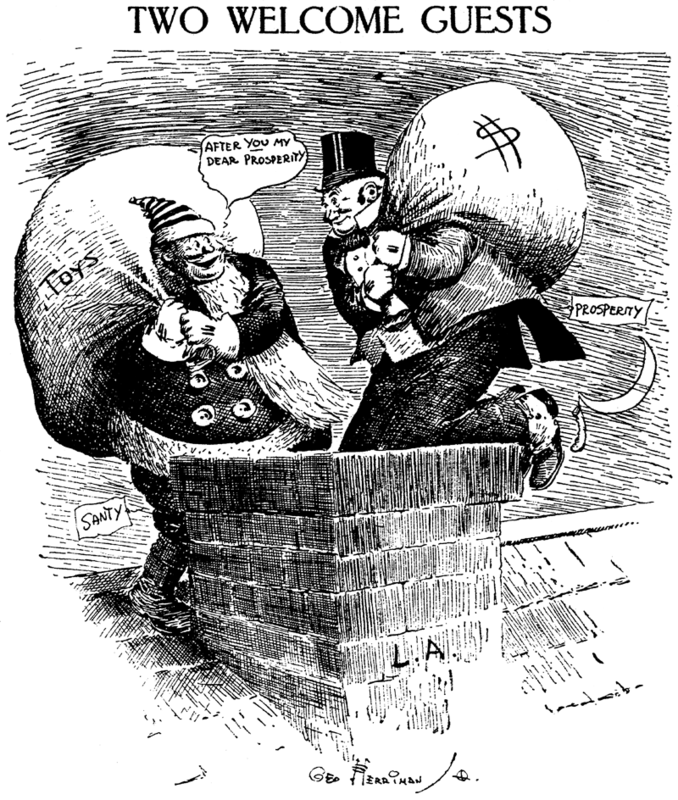 December 16, 1908 -- L.A. is doubly blessed at 1908's yuletide, in Herriman's estimation. 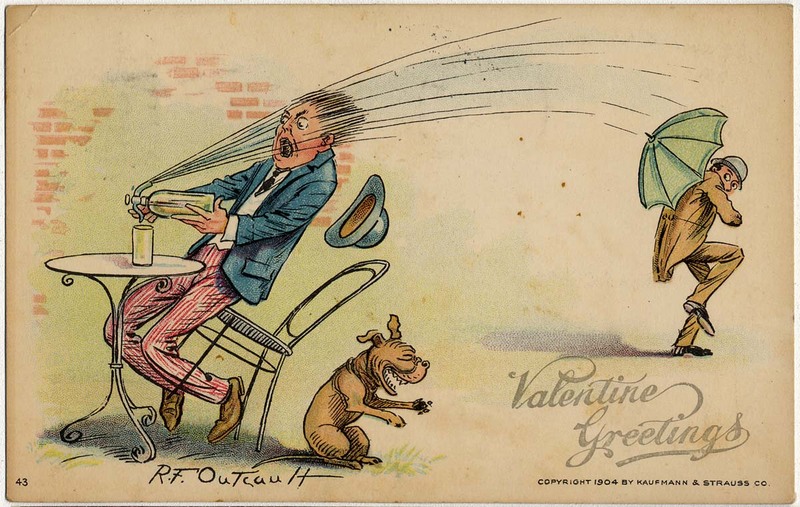 Here's another card from Outcault's 1904 Kaufmann & Strauss Co. series. This one claims a Valentine's Day theme, but what the cartoon has to do with that occasion is beyond my ability to reason out. Kaufman & Strauss had commissioned a series of cards by big name cartoonists, often using their characters, like Opper doing a batch with Happy Hooligan. Outcault seemed to do a Tige-only series. None of them were specific to Valentine's day, in fact the same cards were usually seen with the ornate "Valentine greetings" logo missing. It seems Valentine's day was an extra heavy post card season so they would overprint that same logo in a blank area of the image. William Augustin Kolliker was born in Bern, Switzerland, on October 12, 1905, according to Who’s Who in American Art: 1993–94 (1993) and German Immigrant Artists in America: A Biographical Dictionary (1997) He studied at the Berner Secundar Schule in Bern. Kolliker’s study was interrupted when his family left for the United States. At age 16, Kolliker was with his younger brother Franz and Brooklyn-born mother Agnes. The status of his Swiss father is not known. The trio were aboard the S.S. Yorck when it departed Bremen, Germany on June 3, 1922. The family arrived in New York City on June 15. The passenger list said they were going to see William Folk who resided in Brooklyn at 164 Saratoga Avenue. Folk was Kolliker’s uncle. Kolliker was profiled in the El Paso Herald-Post (Texas), October 29, 1957. He was a staff artist for the New York American and studied at the National Academy of Design. He moved on to the Baltimore American and attended the Maryland Institute. 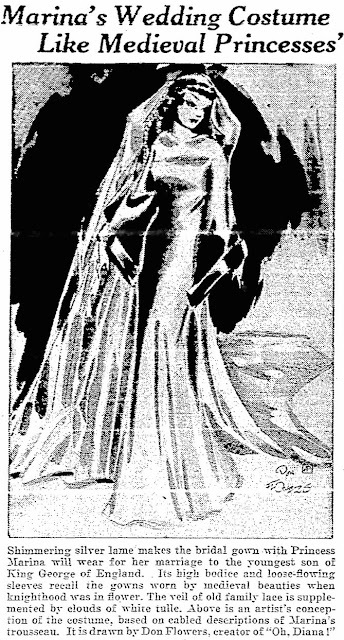 Kolliker returned to New York and produced art for the tabloid, New York Graphic. Who’s Who said Kolliker took lessons at the Grand Central Art School and Art Students League. His next move was to Boston, Massachusetts, where he studied, according to Who’s Who, at the Boston School of Art. Boston city directories, from 1927 to 1929, listed “William C Kolliker” who worked in an art department. The 1930 directory had his name as “William A Kolliker”. The 1930 U.S. Federal Census, recorded newspaper artist Kolliker and his wife, Doris, in Boston at 1687 Commonwealth Avenue. About four months later, Kolliker became a naturalized citizen on August 21, 1930. His birth name was Wilhelm. American Newspaper Comics (2012) said Kolliker took over Don Flowers’s Puffy the Pig beginning October 12, 1931. Kolliker’s run ended March 4, 1933. He was followed by Milton Caniff and Mel Graff. The Herald-Post said Kolliker was illustrator, art editor and art director of Hearst’s American Weekly for 17 years. Kolliker also worked in advertising. Among the books Kolliker has illustrated are Adventures in Puddle Muddle (1935) and Help the Farmer (1943). Kolliker and Doris divorced in 1953. Kolliker married Helen Magruder, a former El Paso and Fort Worth, Texas resident. They moved to El Paso where Kolliker took up painting. He was president of the El Paso Artists’ Association, a director of the Advertising Club of El Paso, and a member of the New York Art Directors Club, the Amateur Astronomers Society, the American Philatelic Society and the International Club. Kolliker’s work was exhibited in galleries and museums. Kolliker’s third marriage was to Marie Mahovich in 1981. Kolliker passed away January 24, 1995, in El Paso, according to the Texas Death Index at Ancestry.com. It certainly wasn't a fully matured, stodgy and profit-centric comic strip world back in 1918, when the biggest newspaper conglomerate in the world would allow one of their star cartoonists to simply say the heck with his world famous comic strip, and try something else on for size. But that's exactly what Hearst allowed Jimmy Swinnerton to do when he put Little Jimmy on the shelf for six months to try his hand at something a little different. On June 23 1918, readers opening their Star Company comics section found that In the Good Old Days was in and Little Jimmy was out. 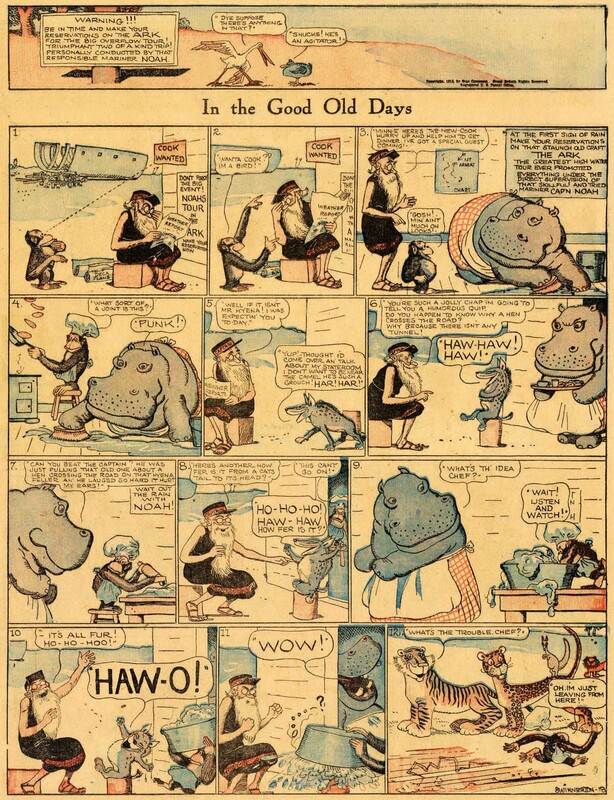 Why the switch was made is impossible for me to say for sure, but I suspect that Swinnerton, after churning out the same strip since 1904 (granted there were other strips along the way), wanted a break. In the Good Old Days was set aboard Noah's ark. After a very promising, jazzy and energetic debut episode (above), the humor slowly but surely devolved. It became very much remindful of the old-fashioned 'in the jungle' comics of the 1890s, where an entire zoology of anthropomorphic animals formed a society based on their stereotypical traits. These weren't especially funny in the 1890s, and I doubt readers were clamoring to get them back in 1918. It took Jimmy Swinnerton six months to get the animal gags out of his system, and on January 19 1919 he had the ark ram into Mount Ararat. That was the end of In the Good Old Days, and readers were presumably delighted when Little Jimmy was back in the next week's funnies section. Thanks to Cole Johnson for the sample scan. Maybe Swinnerton had an eye on reviving the Mount Ararat series of 1901-4, but had to return to the more popular Jimmy. Donald L. Flowers was born in Custer City, Oklahoma, on October 18, 1908. His birth date is from the California Death Index and his birthplace was mentioned in Famous Artists & Writers (1949), The Glamor Girls of Don Flowers (2006) and Find a Grave. A second post at Find a Grave said Flowers’s middle name was Lloyd. The 1910 U.S. Federal Census recorded Flowers as the youngest of three children. 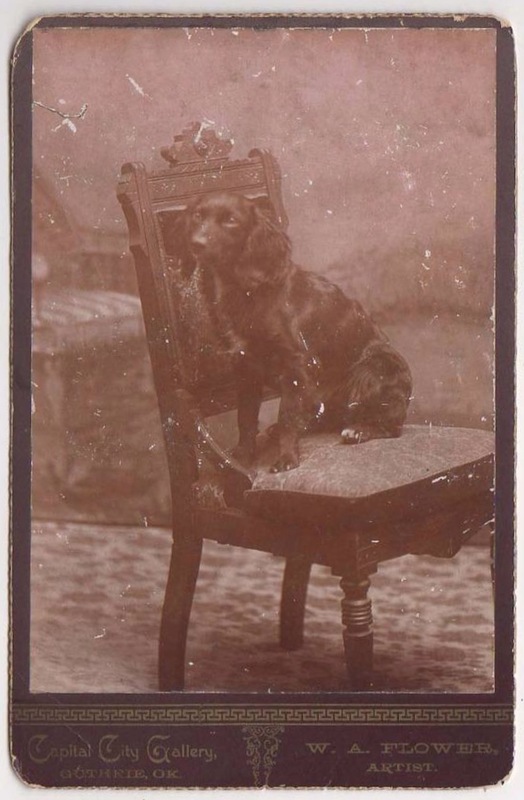 His mother, Mabel, was the head of the household. They lived in Custer City. Flowers’s father, William Adolphus Flowers (according to his World War I draft card), resided in Springfield, Missouri, at 319 1/2 Booneville. Flowers’s father was a photographer who operated a photo gallery. Early in his career he was known as W.A. Flower*. When W.A. Flowers signed his draft card, on September 12, 1918, he was in Kansas City, Missouri, at 414 East 12th Street. He was a photographer at Anderson Photo Company. In the 1920 census, Flowers’s mother had remarried to Al A. Hancock, a barber. Flowers’s home was Kansas City, Missouri at 1307 Cherry Street. Flowers’s father also lived in Kansas City at 1518 Oak Street and continued his photography business. Famous Artists & Writers said Flowers “quit school at the age of 16 to go to work on the Kansas City Star as a staff artist and photo retoucher. It was there that Don first began to develop his latent artistic talents; previously, he had just loafed to high school daily and loafed back and let the days slip happily, lazily by.” Flowers acknowledged the influence of artists Ralph Barton, Jeff Machamer, Russell Patterson and Englishman Gilbert Wilkinson. At age 20, Flowers moved to the Chicago American newspaper and, a few months later, was working for a syndicate. According to the 1930 census, newspaper artist Flowers was married to Jane. The couple lived in Manhattan, New York City, at 5 Prospect Place. Flowers’s mother, a widow, remained in Kansas City where she was an artist. His father had remarried and was a resident in Cleveland, Oklahoma. American Newspaper Comics (2012) said Flowers created several Associated Press panels. 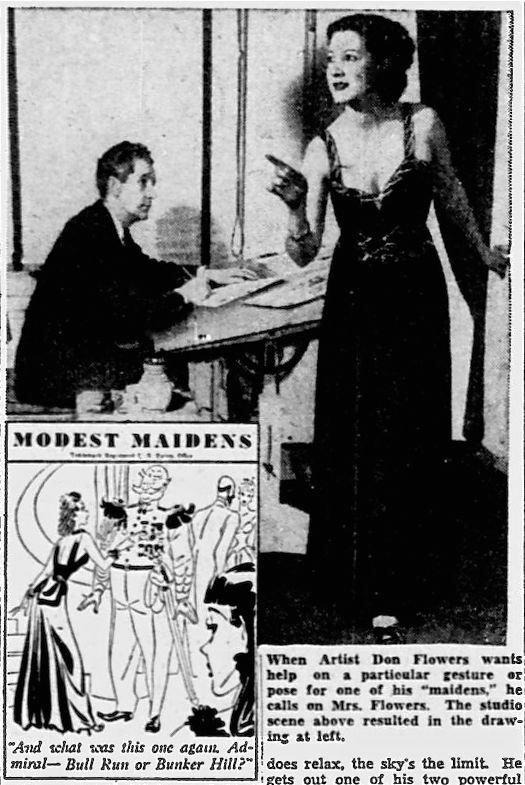 His Modest Maidens ran from March 17, 1930 to October 20, 1945. Flowers drew Puffy the Pig from October 13, 1930 to October 10, 1931. Puffy was continued by W.A. Kolliker, Milton Caniff and Mel Graff. Oh Diana was produced by Flowers from March 17, 1931 to November 1, 1941. He was followed by Bill Champe, Virginia Clark, Wood Cowan, Phil Berube and Vernon Rieck. In the late 1930s, Beauty and the Beach featured Flowers art with Betty Clarke’s text. 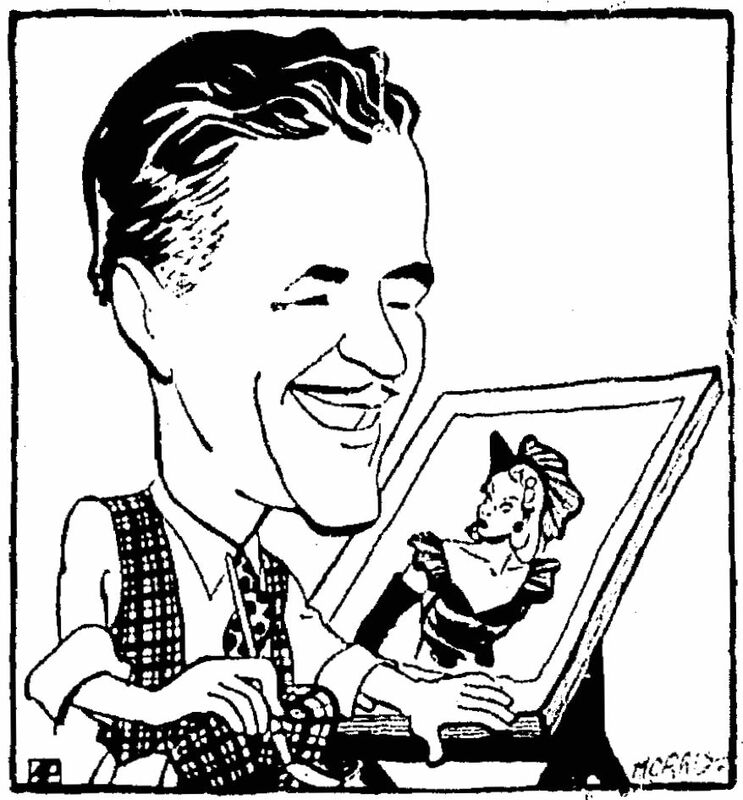 Cartoonist Flowers and Jane resided in Manhattan at 405 East 54th Street as recorded in the 1940 census. His mother continued her artistic career in Los Angeles, California. Flowers’s father has not been found in the 1940 census. The Reading Eagle (Pennsylvania), June 1, 1941, published the article “Model Wife—Mrs. Flowers Helps Husband in Work as Cartoonist”. In his National Cartoonists Society profile, Flowers said he moved to Arizona and California in 1943. He married Maud Connors according to a family tree at Ancestry.com. For the King Features Syndicate, American Newspaper Comics said Flowers began Glamor Girls on October 22, 1945. The daily and Sunday panel ran until February 3, 1968. Flowers passed away January 8, 1968, in Los Angeles, as recorded in the California death index. Additional information about Flowers, by his son, is here. * Under the name W.A. Flower, he was mentioned a few times in the Guthrie Daily Leader (Oklahoma): September 30, 1893; twice in the second column on November 21, 1893; and January 12, 1894. Three photographs by Flower were published in the London-based periodical Strand Magazine, September 1897, on pages 140, 141 and 142. The Bulletin of Photography, June 24, 1914, noted his whereabouts. One of his photographs appeared on page 14 of the History of Photography Part 4: Photography as a Tool (2012). Joe Escourido was evidently a sharp cookie, in that he foresaw as early as 1970 that the upcoming bicentennial was going to make anything related to the American revolutionary era a hot ticket. He created The Colonials, a gag strip about that era, and United Feature Syndicate shopped it around to a somewhat receptive audience of newspaper editors. The strip debuted on November 30 1970 as a Sunday and daily strip in a respectable number of newspapers, but it wasn't long before trouble started. Although The Colonials did beat everyone else out of the gate, in the ensuing years other strips, like Yankee Doodles and Pluribus, began to steal away clients. As important as the Bicentennial was, editors still weren't about to give more than one space to strips that played off it. The Colonials had some problems that made it an easy target for syndicate salesmen urging a change. The major problem was that Escourido seemed somewhat bored by his Colonial era setting, and his humor sometimes had little or nothing to do with the time period. That would have been a big problem to editors. Secondly, Escourido seemed to get a big kick out of sometimes writing dialogue in a Colonial/British accent. What he actually accomplished is to make the dialogue almost indecipherable (see top two examples). In 1973 the strip must have already been in trouble, because the Sunday was dropped that year, and the strip was renamed Colonial Capers - presumably a move intended to show the more dimwitted newspaper editors that the strip was indeed meant to be funny. All of it was to no avail. By the bicentennial year the strip's client list was truly anemic, and it could even be that the strip did not even make it to July 4 1976. It was advertised in E&P that year, but I've never found it running anywhere later than 1975.